Selecting the right diamond blade parameters, often involves a trial and error process. Many which can be avoided through experience and understanding of how to use these parameter for your specific application. What works for one application, may not work for another. While there is no real substitute for experience, even new diamond blade users can quickly become proficient by learning and applying some basic principles of diamond sawing. Visually examine diamond blade for cracks or any other damage. Do not use if damage is suspected. Damaged, incorrectly mounted, our misused blades can be very dangerous to use. Always wear proper safety equipment: Safety footwear, snug fitting clothing, safety goggles, hearing and head protection, and proper respiratory equipment. Make sure to check the diamond blade for run out. If for some reason you feel there is a manufacturing defect, please return the blade where it was purchased with a note explaining the difficulty. Defective blades will be repaired or replaced. Blades improperly used will be repaired or replaced at users expense. Visually examine blade for cracks or any other damage. Do not use if damage is suspected. Damaged, incorrectly mounted, or misused blades can be very dangerous to use. Care should be taken in mounting a diamond wheel. Flanges, back plates and spindle should be clean, free of burs, and run true. By using an indicator and tapping lightly on a wood block held against the wheel, make sure the wheel is within .005. of true rotation. Tighten the flanges securely and recheck with an indicator before using. The use of permanent mounting should be practice where convenient. Please check the shaft of your machine for looseness that may indicate worn bearings. Also, check shaft for wear on the shaft itself. Blade should fit snuggly. A pair of same size flanges with proper relief should be approximately 1/3 the diameter of the blade. Flanges must be free of rust and dirt. Your blade should turn perfectly true after flange nut is tightened. Carriage alignment must be accurate for deeper cuts to prevent blade bending. Do not use blades that rattle or wobble on the saw. Flange diameter affects directional stability of the diamond wheel. For ultra thin Diamond Wheels, your flange size must be 3/4 outside diameter of the blade. Often extending right up to the diamond section. As a general rule of thumb, the largest possible flange diameter should always to be used. Always wear proper safety equipment: Safety footwear, snug fitting clothing, safety goggles, hearing and head protection, and proper respiratory equipment. Always use blade guards provided on machines. Do not remove these safety devices. They are for your protection. Make sure that the arrow on wheel point in the same direction as shaft rotation. Best performance and life will result. Before performing any cutting operations, let the tool run for a few seconds without load. If blade wobbles, vibration or unusual noise occurs, stop the tool immediately. Inspect blade for damage or incorrect mounting. It is extremely important that the part you are cutting is clamped down and hold securely in place. So material does not move, if material does move while cutting it may break the diamond section of your blade. A clamp should be used for this purpose. Do not hold the part (material) with your hands. Doing so is dangerous, and your material will chip. Faster cutting may reduce your working time slightly. However, the major trade off is a significant increase in friction and blade heat up, considerably reducing blade life and increasing the risk of heat fractures and breakage. Meaning if a diamond blade develops dark “burn” marks at the diamond section, the blade is being used is too fast or the amount of pressure is too great. Reduce cutting speed or adjust pressure accordingly. It is generally recommended that you use a blade as fast as it will cut freely. Coolant should always be used to cool and lubricate the blade. Most frequent source for diamond blade damage is cutting without enough coolant. It has been found that generous flow of coolant increases diamond blade efficiency, improves surface finish and reduces heat build-up and material cracks and deformation associated with overheating. Water is most often used coolant, providing excellent performance at minimal cost. Coolant must be applied in the proper place or it will not cool the blade or material being worked on properly. Coolant should always be directed so that the full flow is at the point of contact between blade and material, facing the same direction as rotation of the blade. The amount of coolant used should increase with the hardness of the material being cut. If you see sparks, there is insufficient coolant reaching the cutting zone or its simply ineffective. When cutting in harder materials such as granite, agate, quartz, porcelain, or very hard materials like sapphire and alumina, it is important to have lots of coolant. 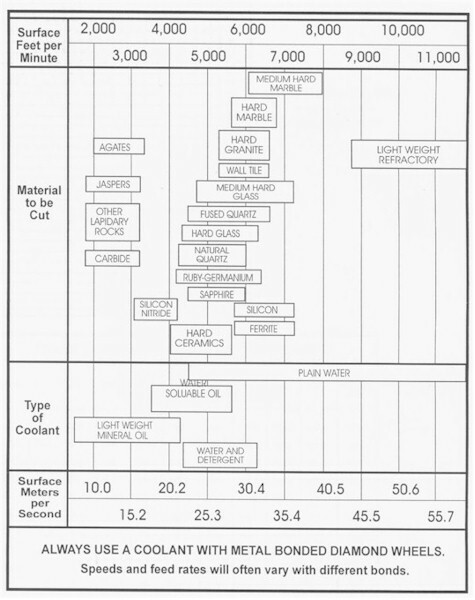 Determine the type of coolant you are planning to use. If you are planning to use water as a coolant, check with the blade manufacturer on what type of water recommended for your blade. City water with 90 psi or running water is usually used for cutting. For some applications, you may want to use an additive with your coolant. If you decide to go this route, you will need a circulating system and the right ratio between your additive and coolant. 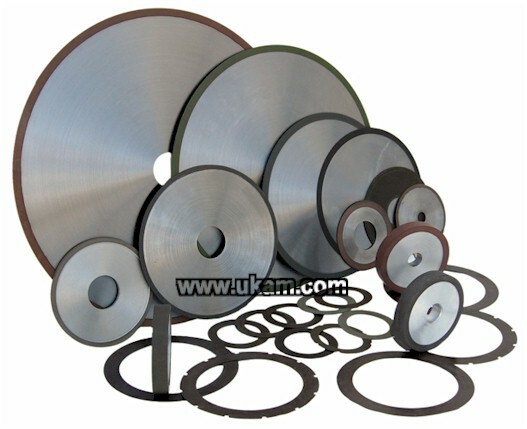 UKAM Industrial Superhard Tools diamond blades for most applications are designed to give you a straight cut in plain water. Although better performance and longer life in some cases may be obtained by using a water soluble coolant. Feed material slowly into blade so the blade does not lead off. Excessive pressure can cause your wheel to bend or dish. Feed rate should never be so great that blade slows down. A diamond blade may occasionally require dressing with a dressing stick made specifically for this purpose. Use coolant for this procedure. The SMART CUT™ Diamond Bond is designed to minimize this procedure. By using enough coolant and following suggested procedures you can rest assured this will require a minimum amount of time as compared to most blades. Most Diamond Blades can be dressed (retrued) several times. Usually the wear on the diamond blade depth takes place on the Blade core and diamond section. Dressing causes diamonds to be pulled out from the blade diamond section (diamond part). For this reason, great care should be taken to reduce this effect. We suggest rexposing the diamond section with a Al203 (alumina oxide) stick after retrueing. This is a very simple operation: just cut into the dressing stick many times. When using diamond blades, it is very important to apply light to medium pressure. Gradually feeding blade it into material, until it begins to cut at its own speed. Increasing pressure on the blade will do little towards reducing the time it takes you to complete a job. But will cause your blade to overload and overheat. This causes not only blade overheat (burn up), but it also heats up the material being cut, causing unwanted material cracks and deformation. If you can see dark “burn” marks around the diamond section, the cutting speed you are using is too fast or you are applying too much pressure. When cutting completely through a piece of material and the cut is near completion, reduce pressure on your blade considerably. Doing so will reduce and minimize back and front side chipping. Never force a diamond blade. Cutting speeds are affected by the hardness and abrasiveness of the material, age and condition of equipment, pressure and coolant. Experience with a specific material and applications allows the operator to develop the right cutting process for their particular application, and taking into account all of the factors discussed above. 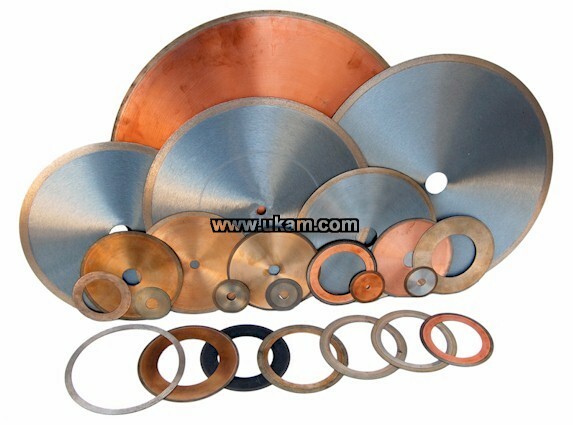 New users, who are just beginning to use diamond blades, are better using thicker kerf blades, applying lower speeds, lower pressure, and a large amount of coolant. Until they are able to build their experience using a specific diamond blade, set up, and application. Doing so will minimize the risk of diamond blade wreckage and material damage. Most frequent source of diamond blade damage is attempting to cut too large piece of material. Maximum material size should not be more than 3/8" blade diameter. Thin Kerf / Ultra thin blades Are used for to obtain more precision tolerances, faster cutting speed, and minimize loss of valuable material. Thinner blades provide less resistance against and impact against material, and can thus be operated at significantly more higher speeds. Including ultra hard & expensive materials minimum loss of material counts the most. Thinner blades will provide a smoother surface finish, faster cutting, greater cutting accuracy, minimize material loss and deformation. Proper Diamond Blade maintenance is very important for optimum cutting performance. Maintaining the diamond cutting edge shape, and rigidity is important to prevent the blade from loosing its sharpness and roundness. should be replaced. If your diamond blade has a tendency to pull to one side, making uneven cuts. Reverse the blade, and try cutting again. If you still have the same problem, it could be your vise alignment. If after reversing the blade still cuts to opposite side. It may be bent or dished. Should this be the case, the blade must be repaired or replaced before further use. Never continue cutting with a damaged Diamond Blade. 1. Always inspect flanges for burrs, warpage, cleanliness and flatness. 2. Check blades carefully before each use for proper alignment and possible defects. 4. Keep bystanders and/or animals out of working area. 5. Make sure all Diamond Blade users comply with safety regulations. For use, see safety codes USA-ANSIB71 and OSHA regulations. Canada - CSA. 1. Do not alter (change) blade inside diameter (ID). Doing so will create unbalanced blade rotation and result in blade wobbling, pounding, or cracking which could be hazardous. 2. Do not stand in line with blade and stream of hot particles. 3. Do not force a Diamond Blade. Most diamond blades are designed for straight line cutting only. Cutting curves can cause stress cracks or fragmentation of the blade. Resulting in possible injury to people in vicinity. 4. Do not use side pressure or grind with side of the blade. Diamond Blade Life & Overall Performance will vary with material hardness, density, Cutting Depth. Few other factors that play a role in diamond drill blade include: RPM's (cutting speed), Feed Rate, Geometry (shape) of Material, Coolant being Used, Coolant feed rate and Direction. Equipment Used, Material Holding Method & experience of operator. While there is now way of accurately predicting Life of your diamond blade. 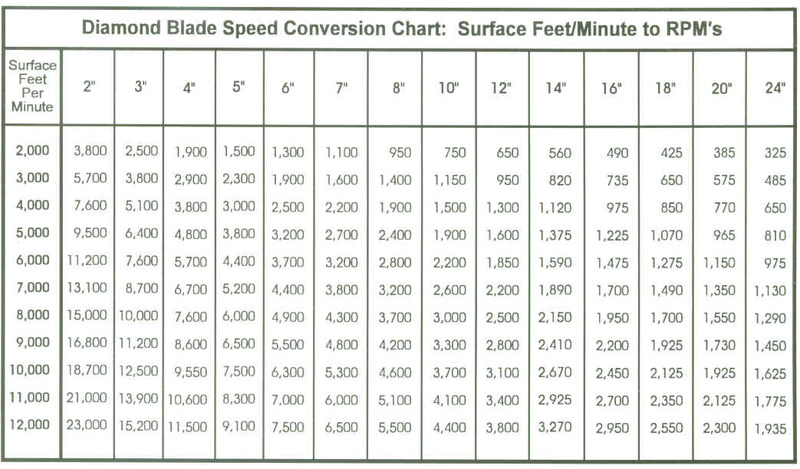 It can be optimized by following Principals of Proper Diamond Blade / Tool Usage. There may also be some experimenting, as well as trial & error involved in the part of the end user. Highly experienced diamond blade users may find some variations in diamond blade life or performance even when working on same material & application for several years. While this phenomena is not too common, it does occur. The machining environment around us is constantly changing. A slight change or variation in any variable can have significant impact on your diamond cutting results. Material being cut can vary in composition or density even when coming from same manufacturer or source. Slight change in coolant feed rate, coolant direction, RPM's, even the way the material is held in place can make the difference. Frequently the cause of the problem may not be obvious and may take as much as several failed attempts to surface. When encountering problems or variation in diamond blade performance. Few stop to think about or carefully examine their cutting process. Many users immediately suspect quality of the diamond blade and are quick in labeling the drill "Defective" or "Poor Quality". This is very rarely the case. Usually in over 90% of these cases the diamond blade itself was not at fault. Most Respectable & Experienced Diamond Blade Manufactures (such as UKAM Industrial Superhard Tools) have rigid quality control and inspection processes set in place. Controlling everything from raw material input, output, to final inspection. What a number of diamond blade users don't realize the technical aspects & delicate nature of diamond sawing/machining process.